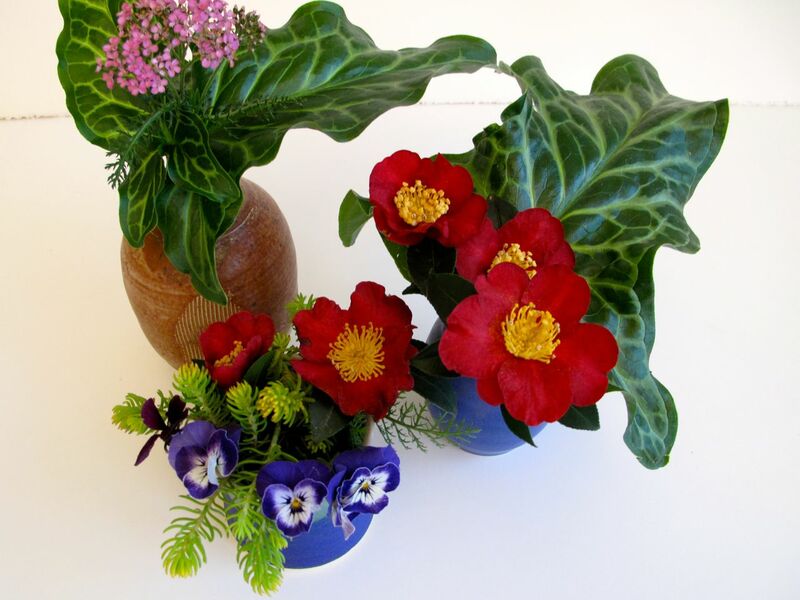 Today I am joining Cathy’s weekly challenge In A Vase On Monday that encourages garden bloggers to create fresh arrangements each Monday using materials found in our gardens. November has been really cold here, but warmer temperatures on Sunday afternoon made foraging for vase materials a pleasant experience. Despite the fact most of the garden has succumbed to recent freezes a single pink yarrow, a few sasanqua flowers and tiny violas were waiting to be chosen. 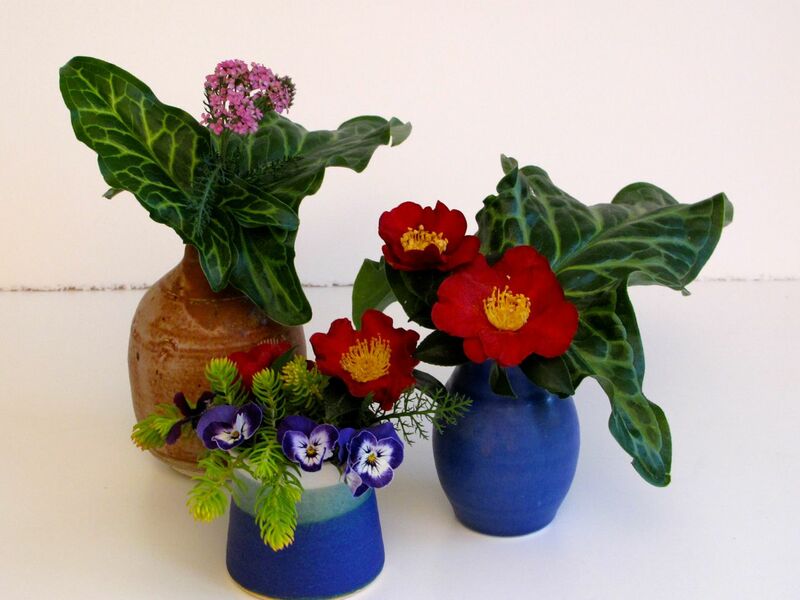 When first brought indoors the collection looked like a motley crew of mixed sizes and limited possibilities, but the interesting part of preparing a vase each week is seeing the personality of the blossoms and leaves emerge. 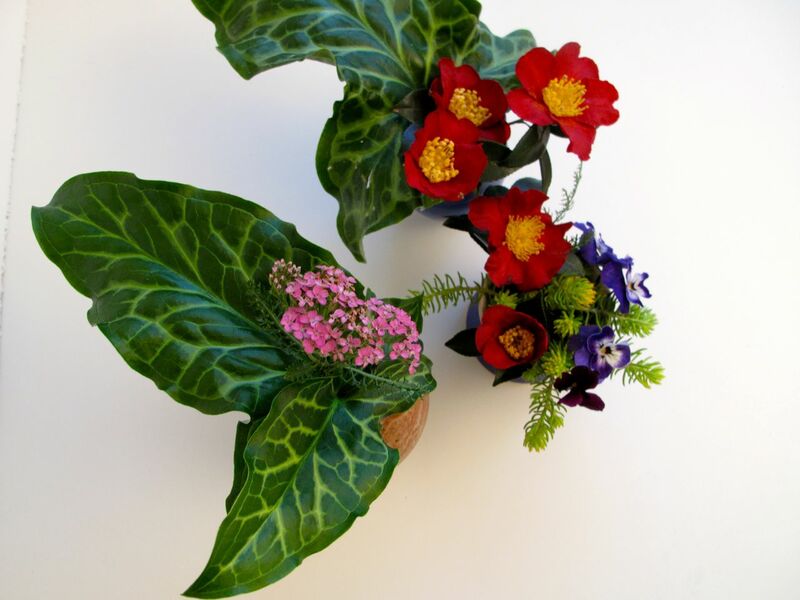 This week, Arum leaves provided a bold starting point and the other items seemed to fit seamlessly after that. I like the effect of pairing chartreuse sedum with the blue violas. The yarrow vase is my favorite individual arrangement, but it was fun moving the three vases around and experimenting with how they related to each other. Many thanks to Cathy at Rambling In The Garden for hosting. Discover what delightful things she and others are placing In A Vase On Monday. 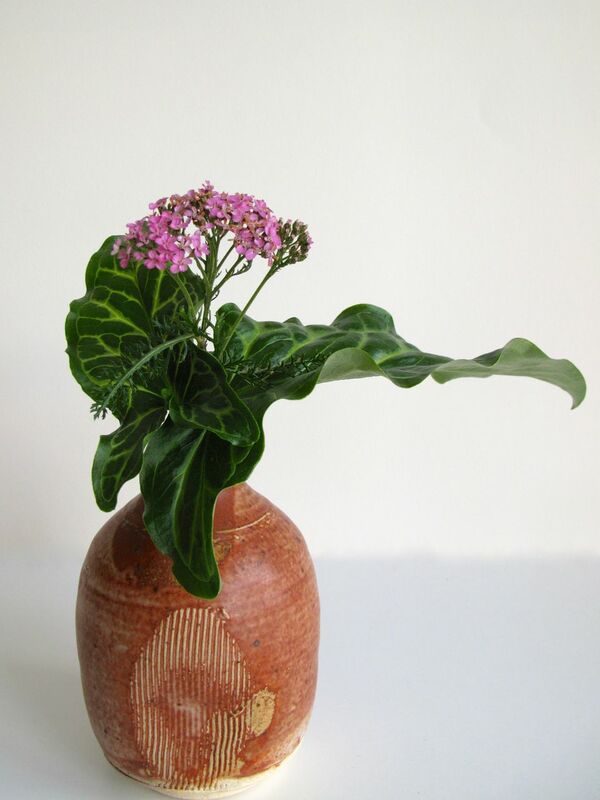 Perhaps you will be inspired to share your own vase. 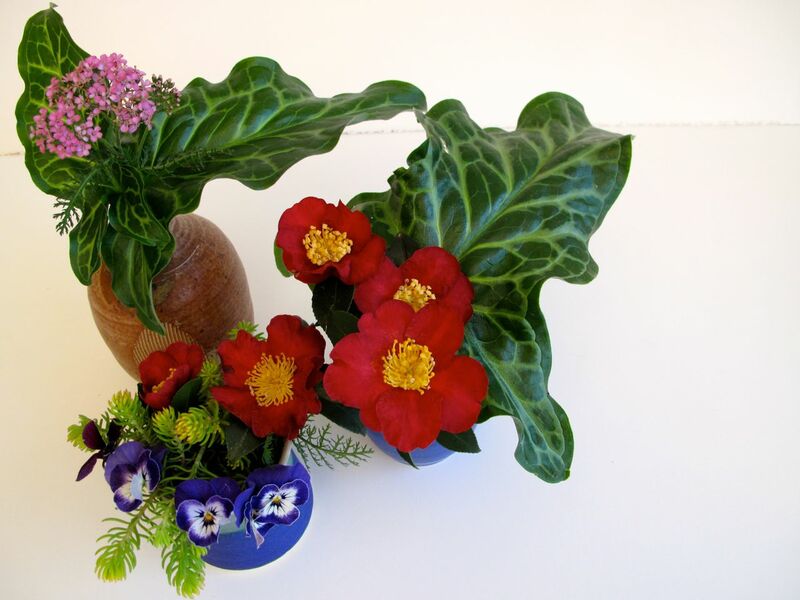 This entry was posted in garden and tagged achillea, Arum Italicum, Camellia sasanqua 'Yuletide', Floral Design, flower arranging, garden almanac, in a vase on monday, Sedum, viola on December 1, 2014 by pbmgarden. What a perfect answer to the fact that it is the 1st December today. Well done for finding and putting them together. I am struggling today for one vase and you have given us three. I do admire the Camellia. Thanks Christina. I started doing these vases in January of this year after seeing several of yours, so I haven’t been through December before, scrounging for flowers. Glad the weather is milder this week to give the camellia buds a chance to open. You have outdone yourself! I like the viola with the sedum too. That’s very nice of you Marian! The viola may become the mainstay of my Monday vases for a while. My new favorite leaf in arrangements. Arum italicum! 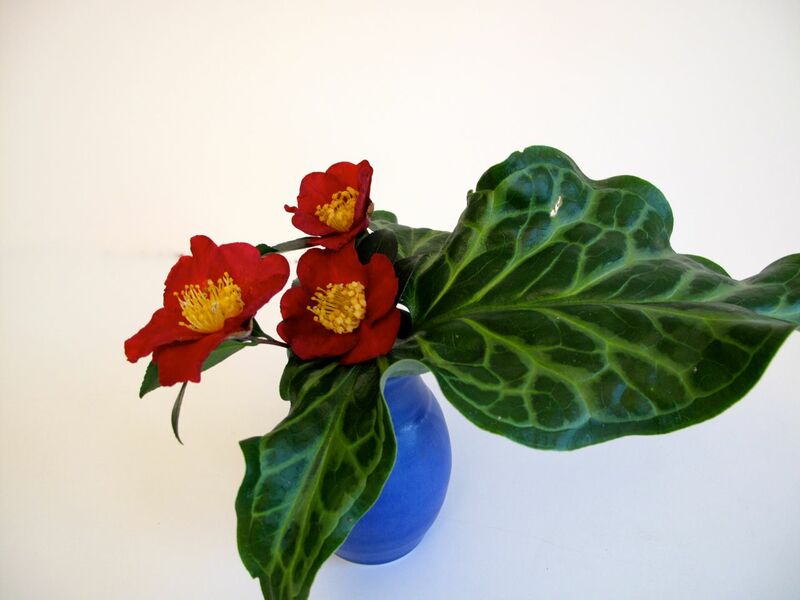 The deep rich color and shape is an interesting backdrop for flowers as you have demonstrated. Glad you used this leaf for today’s vases. Thanks Stepheny, isn’t that arum leaf pattern outrageous? I think it holds up well too but will have to confirm that in a few days. My arum plant is tucked under some shrubs so I almost always miss the flower and spike of seeds. You have a lot more going on there than I do. Well done. Thanks John. I think I cut everything that was blooming though. 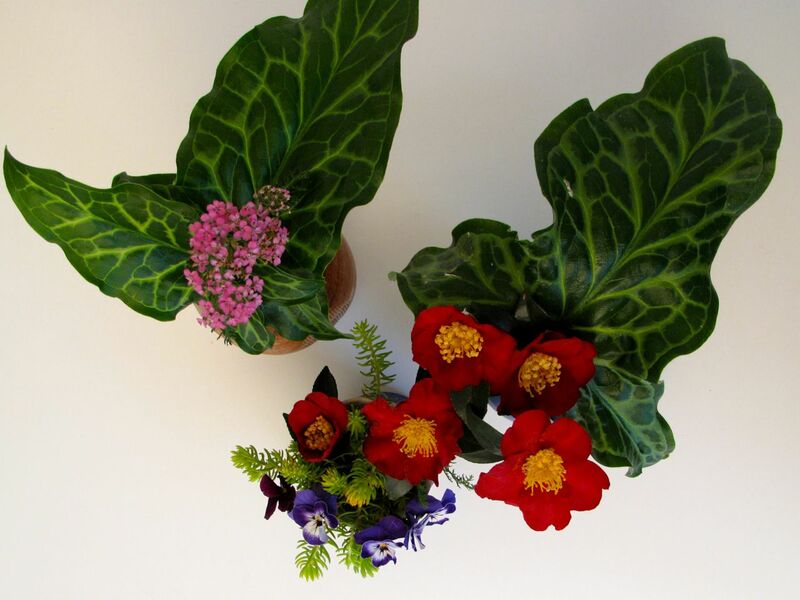 The Arum leaves are beautiful in their own right and tie everything together too, Susie. 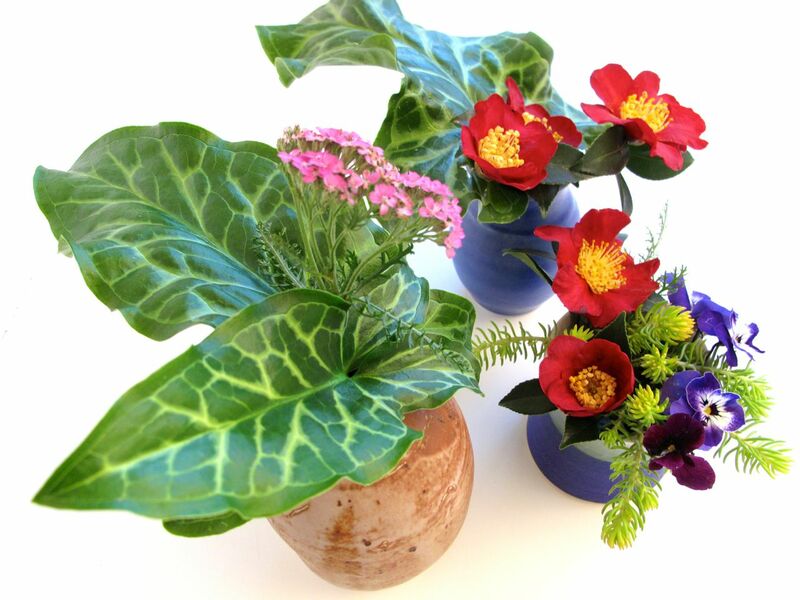 I love compositions using small vases. Kris, I find working with several vases is a lot easier than using a single one, especially if, like today, the stems are of such different sizes. Thanks Cathy. Simple works best sometimes. The Arum’s provide such a nice background for the pretty camelias. 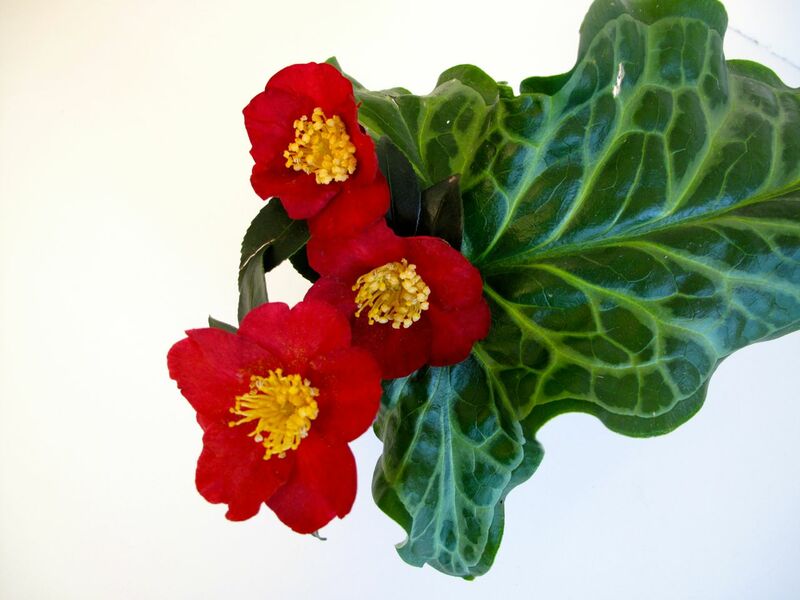 The arum is planted underneath the camellias, almost out-of-sight since the camellias grew larger than expected. 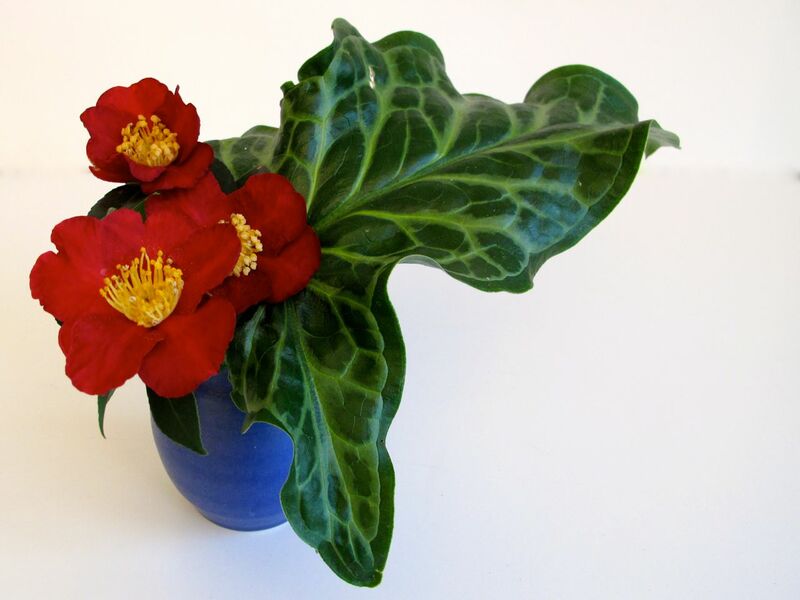 Glad I happened to spot those fancy leaves while gathering some camellia flowers. I like that you have given us some different views Susie, to give a real sense of what you have created today. The colours are fresh and punchy, really attractive. Thank you Julie. Sometimes my arrangements definitely look presentable only from one point of view, so it was fun that these worked from different directions. Susie these are lovely. 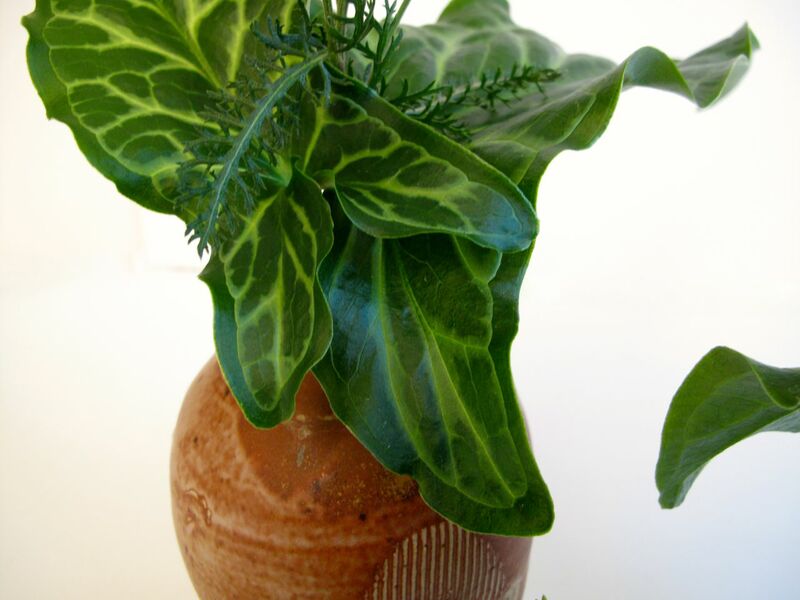 I have always loved the leaves of Arum and I love them even more in your vases….simple and elegant. And I agree the chartreuse sedum is lovely with the violas. Hope your week warms a bit. Donna, thank you. I’ve been surprised at that sedum which seems to be thriving as the temperatures dropped a few weeks ago. Arum are listed as invasive around here, but I haven’t seen any signs of it spreading at all. I’ve been reluctant to remove it because the leaves are so interesting. 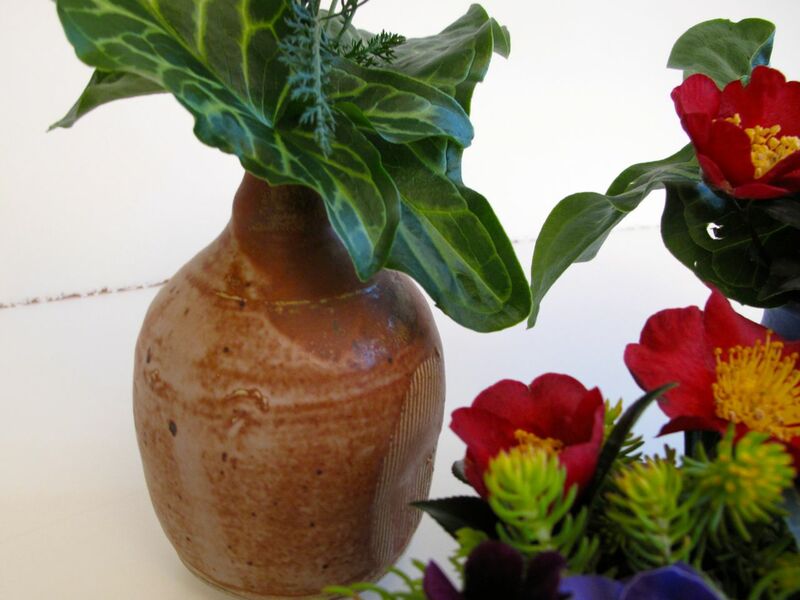 The choice of vase for the viola was inspired Susie! I do love this collection. The arum leaves are stunning and would be lovely on their own too. Thanks Cathy, I hoped the color of the violas would be set off by that vase and their little flower faces do look cute peeking over. Lovely lovely images Susie!! 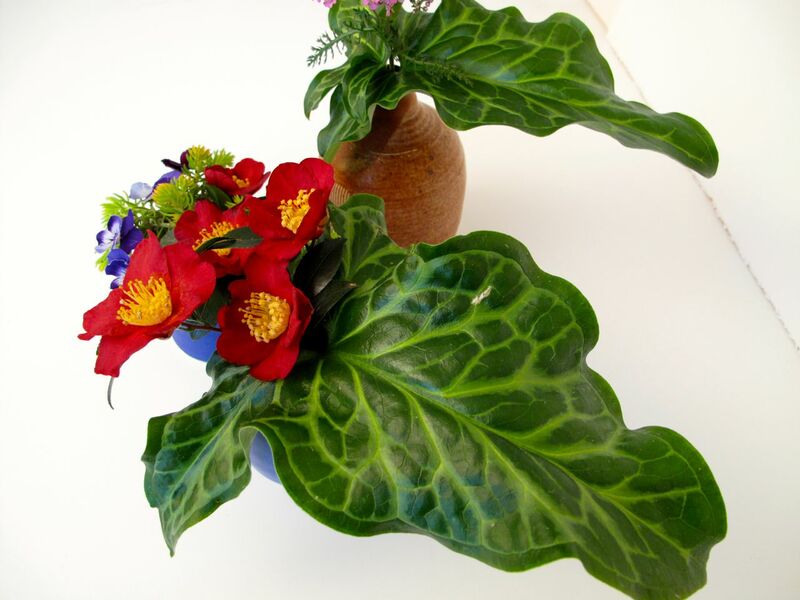 Those arum leaves set off the flowers so well. I appreciate that Julie! The arum leaves were fun to work with this week.